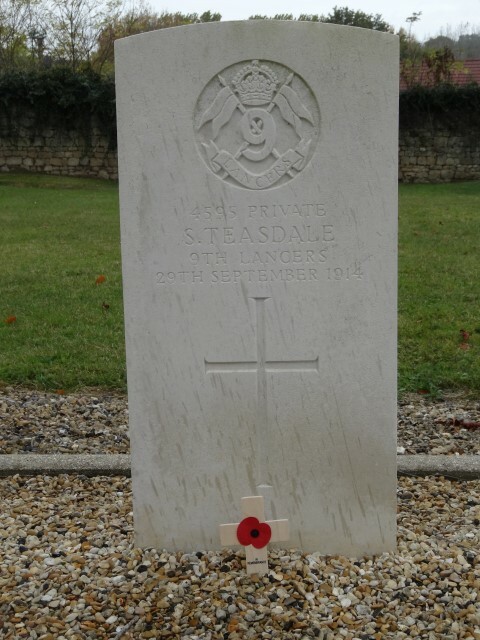 4595 Private Sydney Teasdale, 9th (Queen’s Royal) Lancers was killed in action 29 September 1914 and is buried at Longueval Communal Cemetery, Somme, France. He was about 22 years old and is commemorated on the Cockfield war Memorial. Joseph was born at Lynesack and Sarah at Eggleston (near Middleton-in-Teesdale) in 1891, Joseph Sidney worked as a “Band Master and Tobacconist” at Innerleithen, Peebleshire, Scotland where Sidney was born. In 1901 the family moved back to south west Durham and lived at Church View, in the Parish of Lynesack and Softley. Joseph worked as a coal miner (hewer). By 1911, the family lived at 18 Coronation Street, Cockfield. Ethel and Sidney lived at home with Joseph’s 4-year old grandson Alwyn. 19 year old Sydney worked as a coal miner (labourer). 1902: The Butterknowle Silver Band, conductor Joseph Teasdale, were the winners of the Tees-side and District Amateur Brass Band League Silver Cup, 14 first prizes and 14 gold and silver medals. This photograph shows a young man, possibly Sydney Teasdale. 12 February 1913, Sydney enlisted at Sunderland, joining the 9th (Queen’s Royal) Lancers as a musician, a cornet player. The Division moved to France as part of the British Expeditionary Force (BEF). 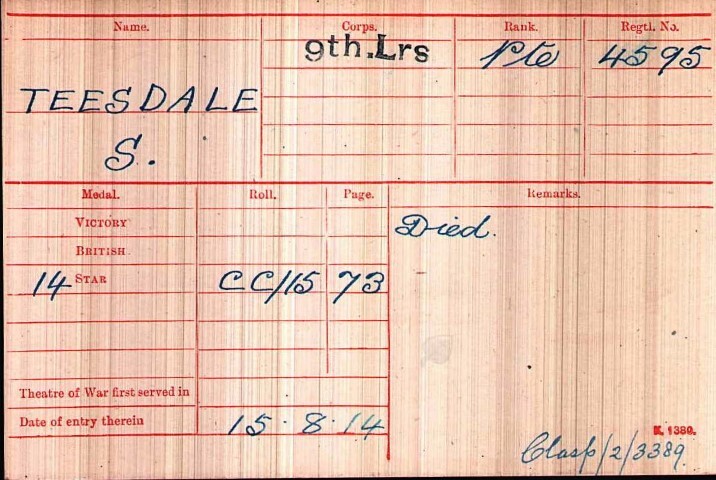 15 August 1914: Private S. Teasdale entered France. The Cavalry Division took part in most of the major actions where cavalry was used as a mounted mobile force and also others where troops dismounted and used as infantry. By the beginning of September 1914, the German Imperial Army had swept through much of Belgium and north eastern France and was fast approaching Paris. By 3 September, the British and French forces had been retreating south west for over 2 weeks. German victory was a definite possibility and the Allied Commander General Joffre prepared to launch a major counter attack offensive. As night fell on 5 September the men of the BEF began to halt approximately 40kms south east of Paris and their gruelling retreat was at an end. For the next 2 days, British I, II and III Corps advanced north eastwards, encountered only minor resistance from the German in the area, which had reached the limit of their advance and were now carrying out a tactical retreat. On 8 September, British Infantry brigades advancing toward the Marne came under heavy machine-gun fire and artillery fire from German units in La Ferte sous Jouarre and on the north bank of the river where they had formed a bridgehead. The British withdrew, began bombing the German positions and by mid-afternoon had entered the town in force. Both of the local bridges had been blown but the Royal Engineers immediately began to construct a floating bridge over which III Corps crossed the Marne on 10 September and joined I and II Corps which had crossed the river further to the east the previous day. The German armies were now in full retreat to the north and east, hotly pursued by the combined British and French forces. Retreating German units fought rear-guard actions under rainfall throughout the day on 11 September and by the morning of the 12th they had occupied defensive positions on high ground overlooking the northern banks of the river Aisne. The Battle of the Marne referred to in the French press as the “Miracle of the Marne” halted the month-long advance of the German forces and decisively ended the possibility of an early German victory. The battle also marked the end of the mobile war and the beginning of trench warfare. Rear-guard Action of Solesmes: 25 August. 24 August 1914: A painting by Caton Woodville depicts the action `Saving of the Guns’ at Audregnies for which Grenfell won his VC. 7 September 1914: Another painting by Caton Woodville depicts the action at Moncel which was the last time the 9th Lancers charged using the lance. It is possible Sydney Teasdale was involved at Moncel as A Squadron was right flank guard but there is no way of knowing unless he is mentioned in one of the personal diaries. Sydney originally served with A Squadron but on the 29 September was with C Squadron – he may have been moved after 24 August 1914 when the Regiment lost men due to wounds or were taken prisoners of war. 4595 Private S. Teasdale was awarded the 1914 Star with clasp, British War and Victory medal. 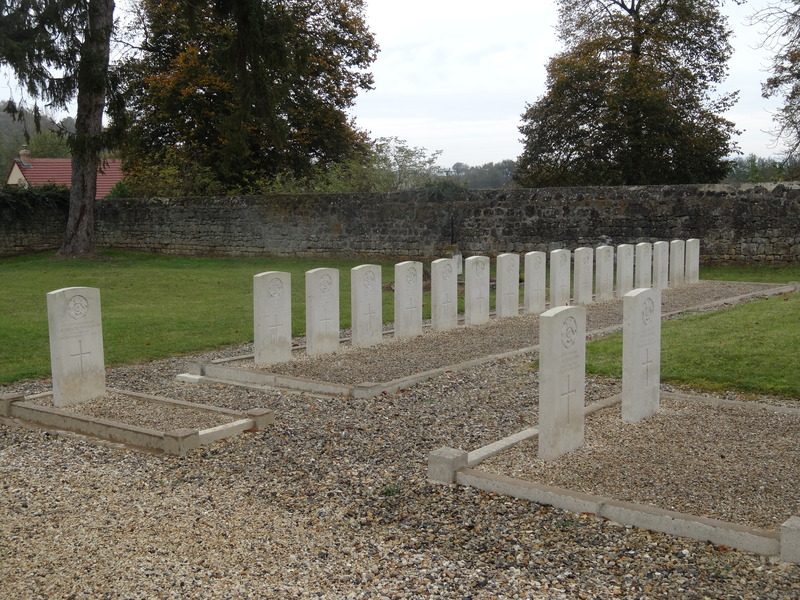 Private S. Teasdale is buried at grave reference B.10, Longueval Communal Cemetery. Longueval is located between Soissons and Rheims. 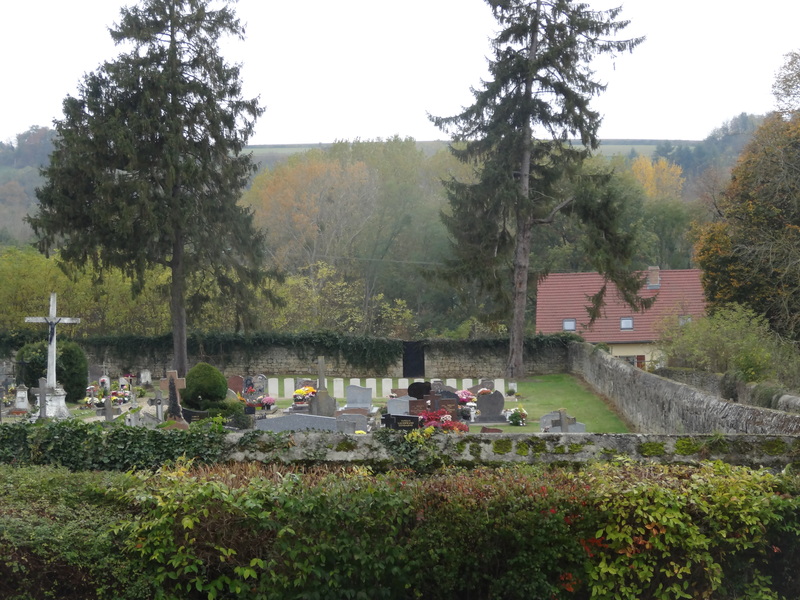 There are 19 burials of the 9th Lancers in the cemetery. There is one Lancer killed in action on the same day who has no known grave. He was 4157 Shoeing Smith W.H. Saward and he is commemorated on the La Ferte-sous-Jouarre Memorial. This memorial commemorates 3,740 officers and men of the BEF who fell in the battles of Mons, Le Cateau, the Marne and the Aisne between the end of August and early October 1914 and have no known grave. Private S. Teasdale is commemorated on the Cockfield War Memorial and the 9th Lancers WW1 Roll of Honour in Canterbury Cathedral.